We are all related, down below and up above. The Earth and Sky are connected, linked by Spirit's light and love. We are all related by the essence of our souls. Together we're the circle. Together we are the Whole. 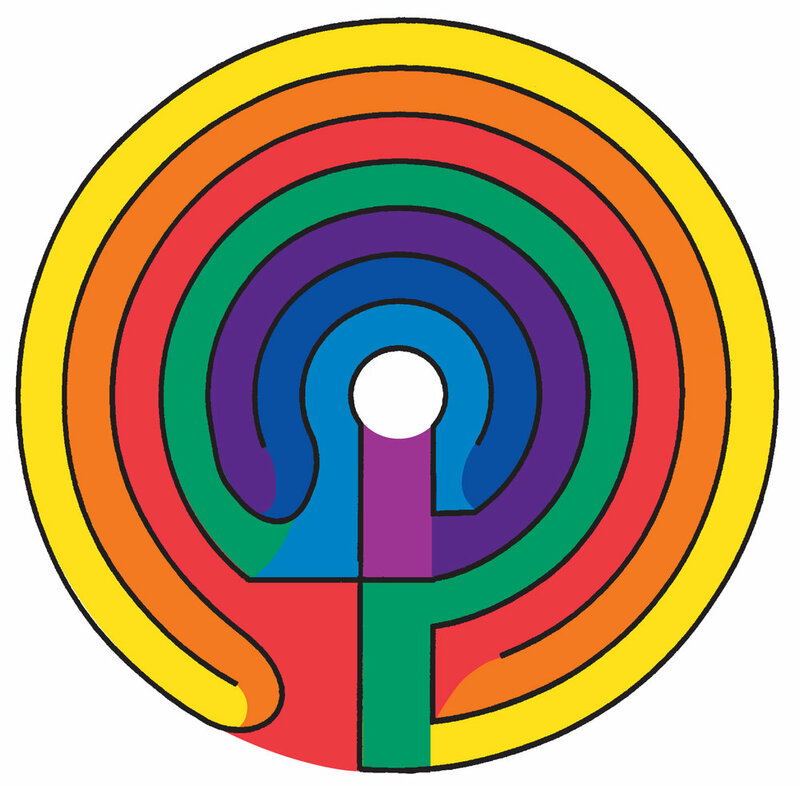 The Seven pathways of the Prairie Labyrinth are set up to correspond with the Seven Chakras. Many traditions recognize seven primary energy centers (Chakras) in our body and associate the seven colors of the rainbow with these pulsating "wheels of light." Like a real rainbow, the chakras act as a bridge, linking your energy to the earth below and the higher realms of Spirit above. The seven pathways of the Prairie Labyrinth are set up to correspond with the Chakra system. As you wind your way through the Labyrinth, you are moving through your own energy body (Root chakra to Crown) using each turn as a "Chakra Station" to identify and Release the chakra related issues you are carrying. In the center of the Labyrinth, you open to Receive what you most need. Following the same pathway out, you are Renewing your energy, bringing it back through your body (Crown to Root), re-entering the world from a grounded and connected perspective. Symbolically, you are bringing Heaven to Earth. You enter the Labyrinth beginning at Path 1 (Red) Root Chakra and progress to Path 7 (Violet) Crown Chakra. Chakra Angels were made out of clay to represent each Chakra path and are displayed at the turns within the Prairie Labyrinth. 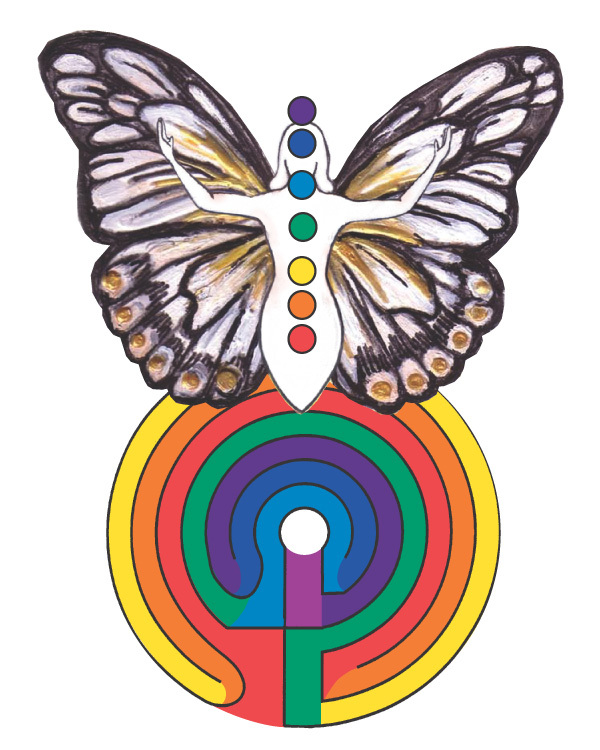 The Chakra Angels were the inspiration for creating the Chakra Labyrinth Cards. Their images are on the front side indicating the chakra you have chosen. Below are the over-arching messages that came from each Angel when they were first created, helping me to understand the larger function of their roles. I am related to Adam Kadmon, the first human. I am the union of opposites, half male and half female, embodying Divine Wholeness. Dissolve your sense of separation and trust the stability of your core foundation. The bloodline of the I Am is infused in your roots. I flow with the kundalini life force energy, stirring your senses awake. Find what excites you and remove your resistance to FEEL. Every relationship is a mirror reflection inviting you to accept yourself. I hold the light of the Great Central Sun. Your internal fire builds your presence, giving you courage to take action and move with confidence in the world. Ignite your true resonance to reveal the Divine. I stand at the gateway of your heart in the crosswinds of your human experiences. This space can take your breath away or it can fill you up. Allow love to breathe through you. My sword cuts away layers of self-deception. The only protection you need is against your ego interpretations. Lean into my energy and trust your inner voice to speak loud enough for you to hear. Give up the demanding distractions of your mind chatter and enter into the still point of your own single eye. Use it as a headlight to see what is right for you. Shifting old perceptions will change the world behind your eyes and redefine what lies before you. I open your mind-shaft and lead you into a passage of amethyst light where you are eternally connected to your Higher Self. Actualize this connection and know you are One. I return to the stillness of my center to connect with ALL THAT IS and receive what I most need. 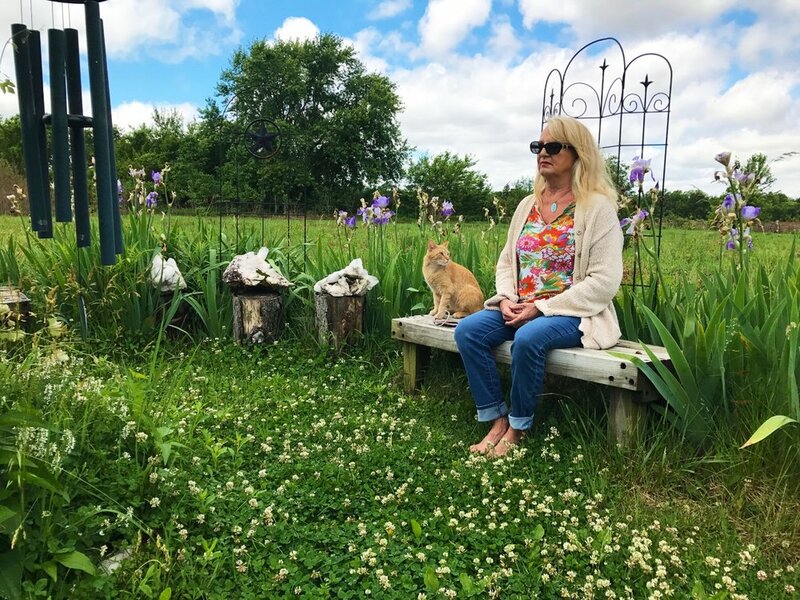 Within the goal area, you come to a resting point with four benches , reminding you to ~ Be still and return to the center of yourself to receive what you most need. This is your time to reflect, relax, meditate, journal or just Be. You can spend as much time here as you desire. When you are ready, you follow the path out, bringing your inner peace with you to re-inspire (in-spirit) your daily living. A Six-pointed copper star, which was once attached to the center post in the labyrinth, now stands in the back as an energetic 'headboard' offering containment and support. 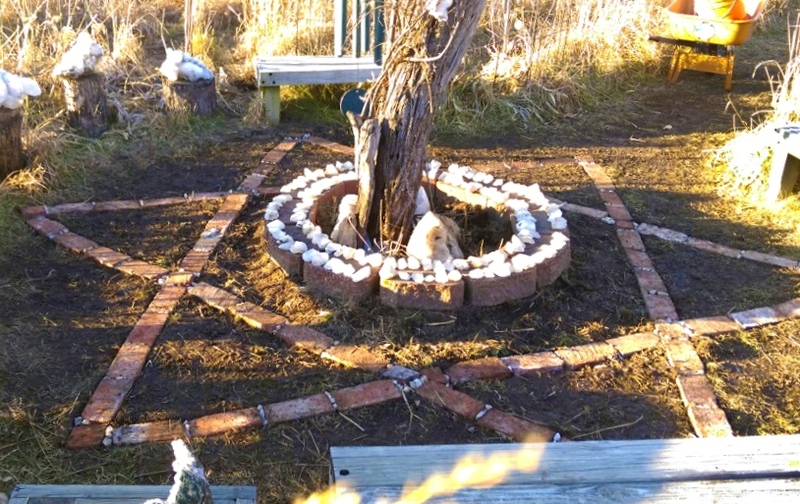 The Star of David design is also set into the ground using bricks from foundational pillars of our house. They were re-purposed to provide a grounding platform to focus your centering experience.144 crystal shards encircle the center, amplifying the portal as a growing pillar of Light. The Six-Pointed Star symbolizes the union of polarity coming into oneness with Source. It brings together Earth and Sky, merging the Divine Feminine and Masculine energies found within each of us to reunite us with our Higher Self Awareness. As a 3-dimensional form, the Six-pointed Star is called a star tetrahedron, or the MerKaBa (our Light Spirit Body). The MerKaBa is a symbol code inspiring unity within the lightbody. It serves as an inter-dimensional gateway where Divine and Human come together. 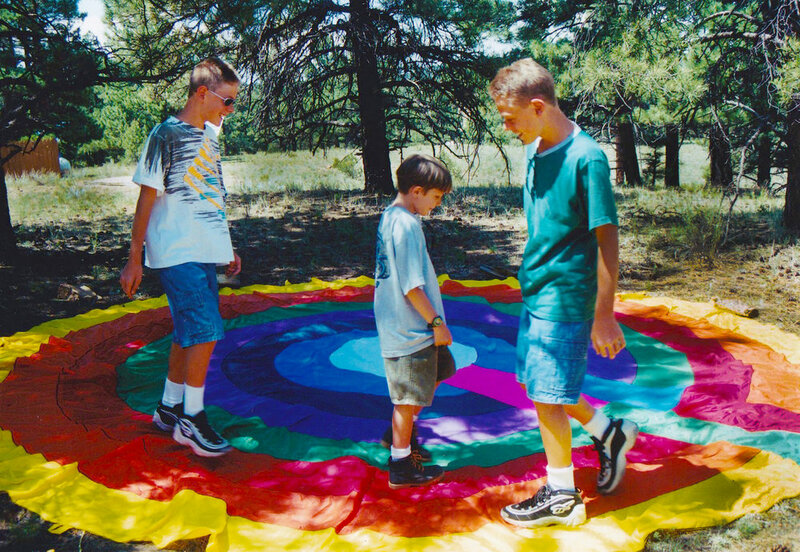 A Chakra Labyrinth (17 ft. in diameter) was sewn by Mary K Barge in 1998 to be used at a community celebration commemorating the Gandhi/King Season for Non-violence with the theme Peace Begins With Me in the Heartland. The rainbow colors associated with the Chakras remind us of the promise of peace among all Nations. They stress equality and unity of diverse cultures and creeds coming together for the good of the whole. When I was introduced to the Labyrinth in 1994, individuals working with the Seven-Circuit Labyrinth who also acknowledged the Chakra connection, placed the Chakra colors according to the order in which you walked the paths (3-2-1-4-7-6-5). Because you entered the labyrinth on the 3rd path, you began your walk at the 3rd Chakra, Solar Plexus and the color was Yellow. The walk took you from your Solar Plexus, to the Sacral, Root, Heart, Crown, Third Eye and you entered the center or goal area from the Throat Chakra. For the first three years, The Prairie Labyrinth was laid out in this widely accepted order. A suggestion was made at the time Mary K was ready to sew the portable labyrinth, to change the color sequence to imitate the order of the Chakras, entering at your Root chakra (Red) and moving to your Crown Chakra (Violet). 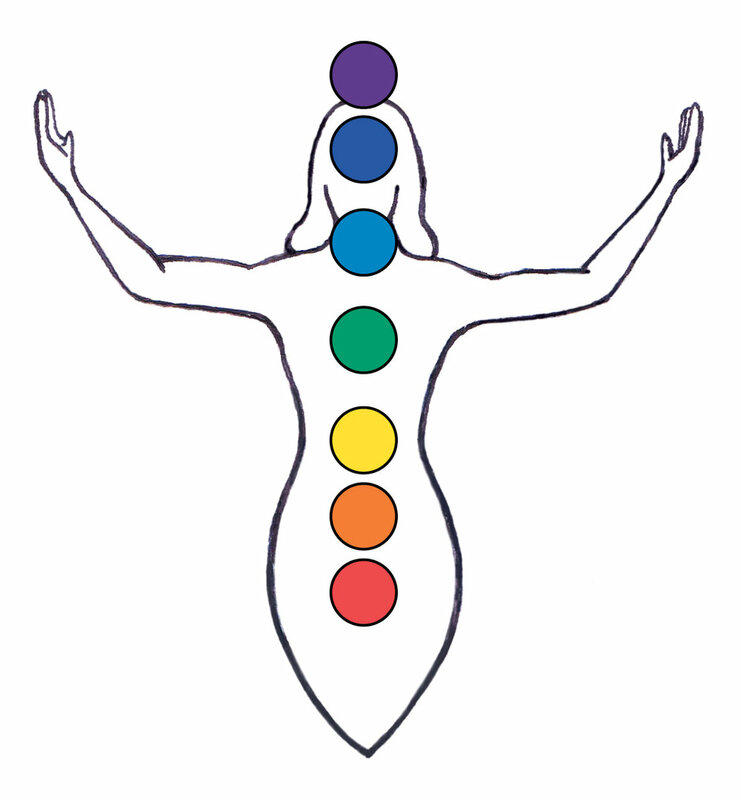 In this arrangement, you are moving through your energy body - following the colors of the rainbow. 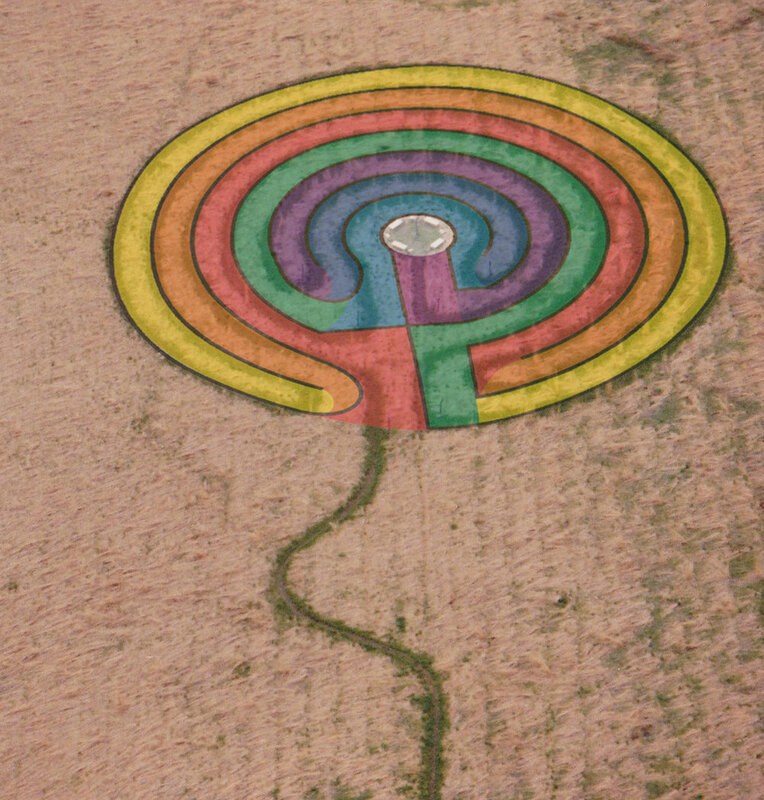 The Prairie Labyrinth paths were re-aligned in 1998 to reflect the natural order of the Chakras. 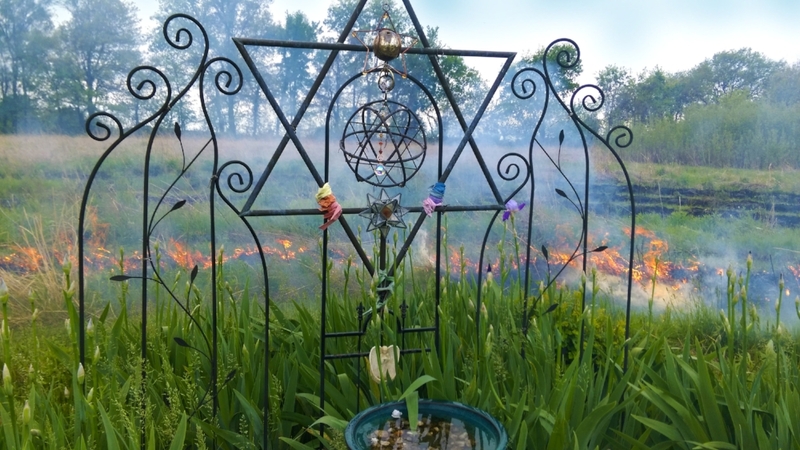 The portable Chakra Labyrinth serves as an extension of The Prairie Labyrinth, bringing the labyrinth experiences to others. 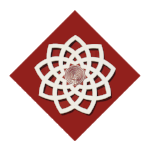 It is ideal to use with the Chakra Labyrinth Cards. An embossed pattern of this design is on the inside cover of the Chakra Labyrinth Cards, and also included as a removable page in the back of Dead, But Not Gone: Are You Part of the Soul-Bridge to Guide Them Home? The Chakra Labyrinth design can be finger-traced as a self-reflective meditation, or used as a portal to assist earthbound souls in the crossing over process.